50+ Participating Boutiques. Free Street Parking. Instagram Giveaways. (JULY 10, 2018) (Alexandria, VA) – One of the longest running seasonal summer shopping events returns to the D.C. region’s Shop Small destination for independent boutiques, Alexandria, Virginia, with the 9th Annual Alexandria Summer Sidewalk Sale happening Saturday and Sunday, August 11 and 12, 2018, throughout Old Town and Del Ray. 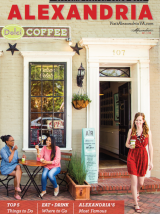 The event, which is led by Visit Alexandria in partnership with the City of Alexandria, the Old Town Boutique District and the Del Ray Business Association, features more than 50 Alexandria boutiques stepping out of their storefronts offering deeply discounted summer merchandise at up to 80% off. Avid deal seekers mark this annual sale ritual on their calendars to score incredible summer finds from local independent retailers. Shoppers can stroll the city’s famed red brick sidewalks for end-of-summer savings on items ranging from fashion and jewelry to home decor, culinary goods, and seasonal gift items. Participating stores such as The Shoe Hive, The Lucky Knot, 529 Kids Consign, Periwinkle, The Dog Park, fibre space, Pacers Running and Kiskadee will have bright yellow balloon markers outside of their storefronts. New boutiques to Alexandria such as Threadleaf, Forge Industrial Works and Twist Boutique will also participate. Many boutiques will open their doors at 9:00 a.m. on Saturday to kick off the sale weekend. The City of Alexandria will provide free parking at meters in Old Town on both Saturday and Sunday; parking is always free in Del Ray. Visit Alexandria will host an Instagram giveaway on the two Fridays leading up to the Summer Sidewalk Sale, August 3 and 10, 2018. Visit Alexandria will post a photo and invite users to tag someone they want to go shopping with for a chance to win a $25 gift certificate. Each comment tagging a unique person equals one entry—so the more comments and tags, the more chances of winning! Two random winners will be drawn on each Friday. The Old Town Boutique District will also host an Instagram giveaway. Simply snap a photo of your favorite sidewalk “steal” and tag #shopOTBD #LoveLocalOT for a chance to win a gift card to a store of your choice. For a complete list of all participating businesses and examples of sale items, visit: VisitAlexVA.com/SidewalkSale. When: Saturday, August 11 and Sunday, August 12, 2018 (rain or shine). If there is inclement weather, Sidewalk Sale tables and merchandise will be brought inside. Where: Participating stores throughout Old Town and Del Ray. Time: Hours vary by retailer; visit website for more information.